Research at the University of Quebec has shown that medicinal roots attain their highest potency in October and November, even well after aerial parts have died off due to frosts. Biennial and perennial plants withdraw nutrients from the leaves and stems and preserve them in their root system for the winter. Once that first frost comes in, plants shift their energy into the root so they can stay strong and survive the cold harsh winter in order to continue its life cycle the following year. Roots are harvested after the first few frosts, up until the ground is frozen. Cold temperatures signal the roots to convert some of their complex starches into sugar, making them sweeter and generally giving them a more enjoyable flavour. Some roots, like dandelion, burdock, and yellow dock, can be quite brittle and easy to break off in the soil. So taking your time when digging them up is important. Roots, in some plants, can take in toxins from the soil; harvest from clean locations. Some plant roots are not to be consumed as they are only to be used for medicinal purposes. If you harvest a root on a plant that has berries or seeds, plant these and encourage propagation for years to come. To clean roots with water using a vegetable brush to clean off the dirt. To tincture fresh, dry (free from water) roots are best. Slice into thin slices and dry below 35 degrees Celsius (95 degrees F.) Air drying is best. Store in mason jars in a cool, dry place out of direct light. This is not a comprehensive list of all roots that can be harvested in the autumn, but there are a few to get you started on your research. Each plant must be properly researched by you, the reader, to ensure your safety when using any of these roots for medicinal purposes. Always seek the advice of a qualified health professional, especially if you are using any prescribed or over-the-counter medications. The list below is meant only to be used as a brief overview. Ashwagandha (Withania somnifera): This is a perennial herb in warmer climates, harvest the first or second year root for medicine or tea only. Interestingly, ashwaganda seeds are used to curdle “plant milks” for use in creating vegetarian cheeses. Astragalus (Astragalus membranaceus): A perennial plant in which you can harvest the 2 to 4 year roots in the autumn once the plant dies back. This root makes a nourishing immune-supporting tea. Known as huang qi in Chinese, the root of this plant promotes longevity, and it can enhance DNA repair. Barberry (Berberis vulgaris): A perennial shrub that is cultivated and grows in the wild. Harvest the root in fall before the hard freeze. Only take a portion of the root, leaving the rest to grow and continue the plant life. Although berries and leaves can be consumed, the root is used for medicinal purposes only. Bayberry (Myrica cerifera): A perennial shrub that likes moist boggy areas with cold winters. Harvest the roots in the fall before a hard freeze and only take a portion of the root so the plant can live on. Although the berries are edible, the root is used for medicinal purposes only. Burdock (Arctium lappa): This prolific biennial plant spreads it goodness generously by seed. Harvest the first year root preferably after the first cold snap. The root can be used as fresh food (it is cultivated in Japan and is called gobo.) Before drying, clean, then cut the root into small pieces if storing for the winter. Once a full size root is dried, it becomes very hard. 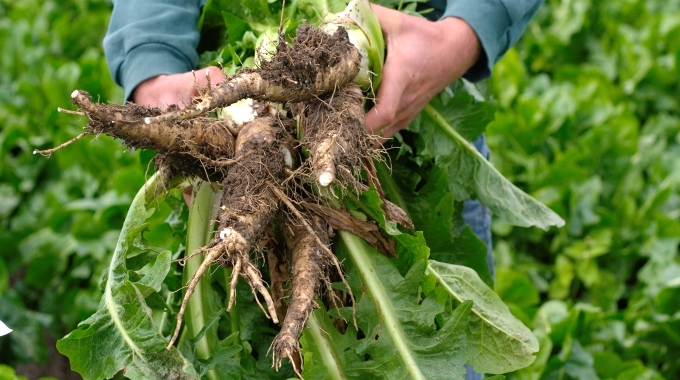 Optimum shelf life for burdock root is about 6 months only. You will need a shovel to harvest these very long roots. Chicory (Cichorium intybus): Chicory is a biennial that can sometimes act like a short lived perennial. Harvest the first year root after the first frost. The root is generally a thick tap root that can reach quite a ways down into the soil. The root snaps very easy so getting a whole root may be challenging; best to harvest when the soil is moist. Comfrey (Symphytum officinale): A perennial herb praised by many herbalists. The root can be harvested in the fall after the first frost right through early spring (ground conditions permitting). The root of this plant has been used medicinally for centuries and continues to be a favourite to help reduce pain and inflammation. Be sure to research this plant carefully. Dandelion (Taraxacum officinale): A perennial plant in which the root can be harvested in the fall once the first freeze falls and through the spring until the first flower blooms. Echinacea (Echinacea spp. ): A perennial herb that is used extensively by natural healers. Harvest the 3 to 5 year roots from the ground after the first frost but before the first snow. Elecampane (Inula helenium): A perennial herb. Harvest the second year root after the first freeze and before the first snow. This plant has a large taproot that can be over 30 cm (12”) long, be sure to use a shovel. Ginger (Asarum canadense): A hardy perennial herb that grows in many forests. This wild ginger is not related to the ginger most commonly known (Zingiber officinalis). Dig up rhizome in fall after leaves have shriveled and dried. Japanese Knotweed (Fallopia japonica): Conservationists are quick to condemn this valuable plant yet its value to us as food and medicine is phenominal. Roots are successfully being used by many in treating lyme disease as well as many other health ailments. Jerusalem Artichoke (Helianthus tuberosus): The roots of this plant are also known as sunchokes. The roots are widely sought after as a source of food. Marshmallow (Althea officianlis): This perennial herb is not only found near marshes, bogs, or damp meadows, it is a cultivated plant as well. The root is best harvested once aerial parts start withering away in the autumn. Mallow (Malva neglecta): The common mallow grows in many countries and does very well in dry disturbed soils. Although the root can be harvested any time, for a sweeter root, harvest in the autumn after the first hard freeze. Mullein (Verbascum thapsus): Mullein is a majestic, tall, biennial herb. Although the leaves and flowers are well-recognized for its medicinal abilities, the roots although have medicinal values. Harvest the first year root after the first frost and throughout the winter (if not frozen solid) until spring when the stem starts to form. Queen Anne’s Lace (Daucus carota): Although this root will be tough, harvest the first year root in the fall after the first frost. It can be used to make soup stock, added to your homemade tea blends, or even dried and ground into a powder to use with other spices as a condiment. Stinging Nettle (Urtica dioica): This multi-purpose plant is a perennial favourite that is enjoyed by foragers and herbalists. Harvest the root any time between the first killing frost of autumn into early spring before the plant starts to leaf out. In addition to being edible, the roots are able to provide relief for urinary disorders and enlarged prostate as well (some studies indicate the root contains specific chemicals that can help treat prostate cancer.) It also works in conjunction with modern medicine to help increase cancer survival rates. Sweet Flag (Acorus calamus): Sweet flag likes to grow in boggy waterside locations. The rhizomes make up a thick mat that is messy to clean, but very worth the effort. Collect the rhizome after the first freeze. The roots have a sort of gingery, spicy taste with a touch of bitterness to them. Teasel (Dipsacus fullonum): Harvest the first year root of teasal after the first hard freeze. Be sure to wear gloves as the leaves can be hard on the hands due to its spikes. The root when used tinctured is said to help support those with lyme disease. Valerian (Valeriana officinalis): A perennial plant in which harvesting the root after the first hard freeze is best. This is used medicinally only. Yellow Dock (Rumex crispus): This biennial has a root that grows thick, deep, and is one of the harder roots to harvest. It is more easily harvested when the soil is wet. Wow thanks Karen. This is awesome info and I so appreciate it. Love all you do! Can we root harvest in spring?